NASA astronaut Barry "Butch" Wilmore (left) and Russian cosmonauts Alexander Samokutyaev (center) and Elena Serova pose with their Soyuz TMA-14M spacecraft ahead of a September 2014 launch to the International Space Station. A Soyuz spacecraft will launch a new U.S.-Russian crew on a swift six-hour flight to the International Space Station today (Sept. 25), and you can watch the action in space live online. A Russian Soyuz rocket carrying the Soyuz TMA-14M spacecraft towers over its launch pad at Baikonur Cosmodrome ahead of a Sept. 26, 2014 local time launch (Sept. 25 Eastern Time). The mission will launch the new Expedition 41 crew to the International Space Station. NASA astronaut Barry "Butch" Wilmore and cosmonauts Alexander Samokutyaev and Elena Serova are poised to blast off for the space station at 4:25 p.m. EDT (2025 GMT) from the Central Asian spaceport of Baikonur Cosmodrome in Kazakhstan, where it will be early Friday morning, Sept. 26, local time. Serova will make a bit of space history with the launch, when she becomes Russia's fourth female cosmonaut to fly in space and the first Russian woman on the International Space Station. You can watch the Soyuz launch webcast live on Space.com, courtesy of NASA TV, beginning at 3:30 p.m. EDT (1930 GMT). NASA will also provide a live webcast of the Soyuz spacecraft's arrival at the space station at 9:45 p.m. EDT (0145 GMT), and another webcast at 11:30 p.m. EDT (0330 GMT) as the Soyuz crew joins the current station residents. NASA astronaut Barry Wilmore (left) and Russian cosmonauts Alexander Samokutyaev and Elena Serova pose for a crew photo after press conference held at the Cosmonaut Hotel in Baikonur, Kazakhstan on Sept. 24, 2014. They will launch from Baikonur Cosmodrome on Sept. 26 local time (Sept. 25 U.S. Eastern Time). Wilmore, Samokutyaev and Serova will live and work aboard the International Space Station until March 2015, first as part of the outpost's Expedition 41 crew and later as the core of its Expedition 42 crew. They will join American Reid Wiseman of NASA, Alexander Gerst of the European Space Agency and Russian cosmonaut Maxim Suraev, who currently live on the station. Wilmore will ultimately command the Expedition 42 crew. "[I'm] looking forward, actually, to all of it," Wilmore told Space.com, adding that he was especially excited about the science and possible spacewalks during the flight. "It's all going to be great and fascinating." The Soyuz launch today will mark the second spaceflight for Wilmore, 52, who is a captain in the U.S. Navy and hails from Mt. Juliet, Tennessee. But this flight will be his first long-duration trip to the space station. He last visited the orbiting laboratory in 2009 as the pilot of space shuttle Atlantis during NASA's STS-129 mission, and spent nearly 11 days in orbit. Cosmonaut Alexander Samokutyaev, 44, is the only veteran of long-duration spaceflight on the Soyuz crew launching today. He last visited the space station in 2011 as part of its Expedition 27/28 crew, and spent 164 days in space. Samokutyaev is from Penza, Russia, and is a lieutenant colonel in the Russian Air Force. Cosmonaut Elena Serova, 38, is the only spaceflight rookie on the Soyuz crew launching today. Like Samokutyaev, she is a test cosmonaut. But Serova is not a member of the Russian military. She was selected as a test engineer cosmonaut for Russia's Federal Space Agency (Roscosmos) in 2006. Serova counts Russia's female cosmonaut pioneers Valentina Tereshkova (the first woman in space), Svetlana Savitskaya (the first female spacewalker) and Elena Kodakova among her role models. "When I was in school my first teacher told us about different achievements in cosmonautics, and I was very much impressed by those first flights, from Svetlana Savitskaya in particular, who was the first woman performing a spacewalk," Serova said in a NASA interview. "She was an amazing individual." Today, Serova is the first female Russian cosmonaut to launch since Kodakova's final flight in 1997, aboard a NASA space shuttle. Kodakova spent 169 days in space on Russia's space station Mir between October 1994 and March 1997, then revisited Mir for just over nine days in 1997 during the shuttle mission. Serova said she is aware that her mission might serve as an inspiration to other Russian girls today, just as those earlier missions inspired her. "Well, that’s not a goal per se in my mind, although I think it would be something good," she said in the NASA interview. "I think any of us would be lucky to be a role model for the future generations, and especially if we want our kids, our grandkids, to be good people." 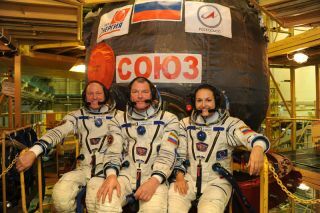 Visit Space.com today for complete coverage of the Soyuz launch to the International Space Station.